An English instructor once told me that there are three basic types of conflict in stories. There are cases of people verses people, people verses an environment and people in conflict with their inner selves. Most video games focus on people in conflict with other people, with variations on theme (people verses aliens, ants verses ants, robots verses giant sea monsters). The external conflict of one person/alien/robot being pitted against another is where the action is, it is what gets the blood pumping. Micropolis is a rare case of a video game presenting us with a pure person vs environment scenario. 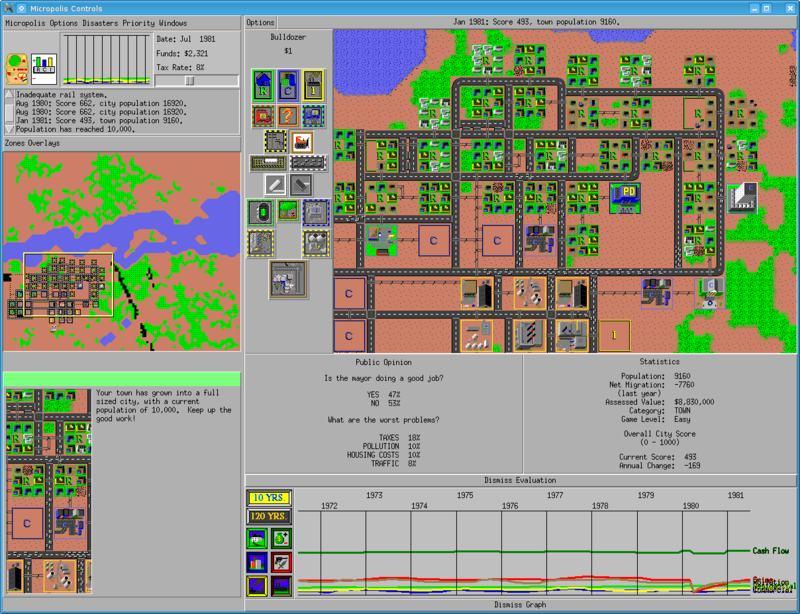 Micropolis is actually an open source port of the classic SimCity game which was popular in the early 1990s. 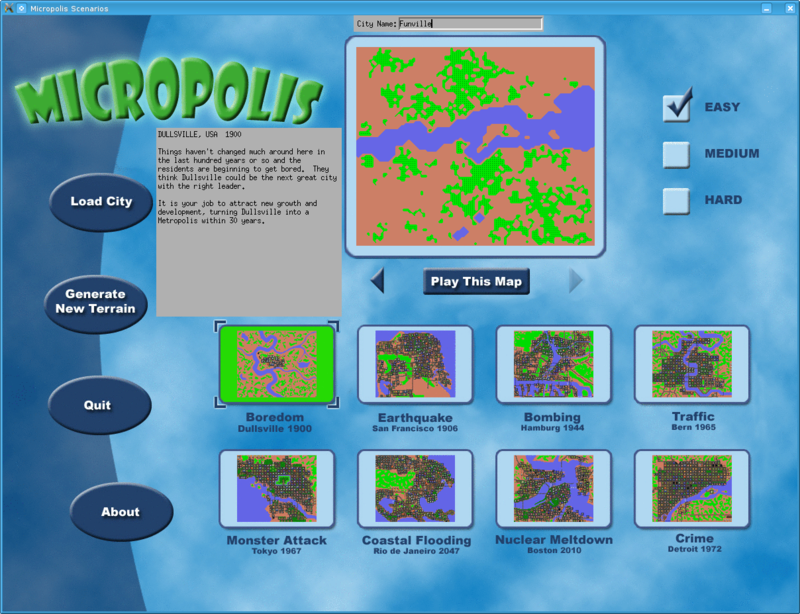 Micropolis has a slightly more modern and flexible interface when compared against the original SimCity, but the game’s general layout, mechanics, style and graphics have stayed quite close to the original. The basic idea behind Micropolis is that we are in charge of a small town and we are tasked to building it up, giving people places to live and work, ways to travel between work and home. We are tasked with providing electricity to our citizens, keeping them safe from crime and helping them recover when disaster strikes. We select where to build, what to build and how much tax to charge our citizens. This fairly small and, on the surface, simple concept can become surprisingly detailed and engaging. A person can quickly lose hours of time, adjusting tax rates, laying out roads and trying to balance population with available jobs. When we start playing Micropolis we have the option of starting with a fresh slate, a brand new town with no buildings or people that we carefully construct from the ground up. Alternatively, we can select one of a group of pre-made scenarios which focus on growing existing cities or fixing certain key problems. A problem may involve cleaning up crime or dealing with heavy traffic on limited roads. The key limit on our power is money. In each scenario money is limited and each building or improvement we add to our city drains our cash reserves. Money can be regained through taxes, but here a careful balance must be struck. On the one hand, if taxes are low then we do not gather enough revenue from our citizens and we can no longer build the infrastructure they need. On the other hand, if taxes are high, then people will pack up and leave our city. When the people leave our revenue from taxes drops and we are once again left unable to build or fix problems. A careful balance must be found. One quirk of Micropolis I noticed is the citizens of our tiny city appear to prefer an approach of financial conservatism. I ran a couple of scenarios. In one game I created a city where industry and residences were separate, the city was decorated with parks, roads were wide and numerous. My city had plenty of police stations, public transit and fire stations. In short, I felt it would be a great place to live, booming with cheap housing and plenty of shopping centres. The tax rate was relatively high to pay for all of this. The virtual people did not like it and my city’s population quickly stagnated, the city lost money and slowly turned into a ghost town. In another scenario I left taxes low and built very little. 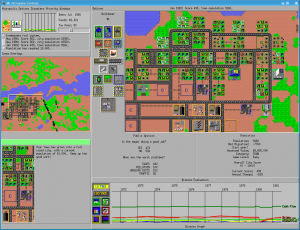 I placed industrial areas next to residential area, built cheap, narrow roads and no parks. There were no police and no firefighters. The people were happy and the city grew, slowly bringing in money and expanding in population. For better or worse, the people in Micropolis appear to value low taxes over all other incentives. Micropolis has some strong points and weak ones. On the plus side the game is engaging, it provides virtually endless possibilities to build, shape and experiment. It is an ideal game for people like me who enjoy playing in a sandbox, constructing, destroying and tweaking things to see how the virtual characters will react. It is fun to grow a city, save the game and then see what happens if we double taxes, build a dozen new commercial zones or bulldoze half of the houses. The freedom is wonderful and balancing the game’s budget is challenging enough to keep me on my toes. 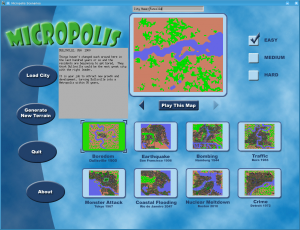 On the down side, Micropolis is a continuation of a game that was popular twenty years ago. The graphics are dated and the number of buildings we can construct is limited. The game is simple in both its concept and its appearance which may put off some potential players. In short, this is more of a thinking game than a looking-at-stuff game. And it is a game I had a lot of fun playing.